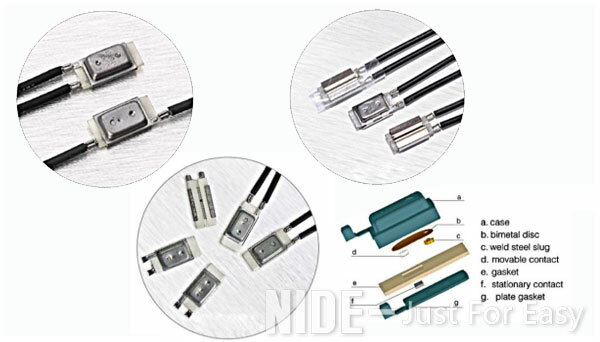 thermal protector for electric motors-Ningbo Haishu Nide International Co., Ltd.
and is a thermal protector using a bimetal as a temperature sensing element. The thermal protector is composed of two different alloys, which will generate heat after passing through the current. When the electrical appliance is working normally, the bimetal is in a free state, and the contact is in a closed state. and the alloy tends to bend in one direction. The bimetal element is heated to generate internal stress and acts quickly. When the contact leaves, the contact is opened to cut off the circuit, and the electric appliance is powered off, thereby providing thermal protection. When the temperature drops to the set temperature, the contacts automatically close and return to normal operation. household appliances snap-on thermostat, PCB board relay and so on. According to the nature of the action: can be divided into normally open action, and normally closed action. and the lead should not be pulled, pressed or twisted. b. When the thermal fuse is fixed by screws, riveting or terminal, it should be able to prevent mechanical creep and avoid contact failure. c. The connecting parts should be able to work reliably within the working range of the electrical product without being displaced by vibration or shock. do not force, press or twist the thermal fuse and lead; after soldering, immediately cool for more than 30 seconds. paying particular attention to the maximum continuous temperature of the thermal fuse. Note: The nominal current, lead length and temperature can be designed according to customer requirements. heat generation and cooling rate of the protector. The reliability and performance of the thermal protector is such that the protector is mounted in the motor for testing. When using a thermal protector, it must be determined whether the thermal protector is self-resetting or non-self-resetting. In general, self-recovery can be used unless the motor is accidentally restarted, which may cause danger or damage to the user. heat protector. Examples of applications that require the use of non-self-resetting protectors include fuel-operated motors, waste processors, conveyor belts, and more. Examples of applications that require the use of self-resetting thermal protectors are refrigerators, electric washing machines, electric clothes dryers, fans, pumps, etc.